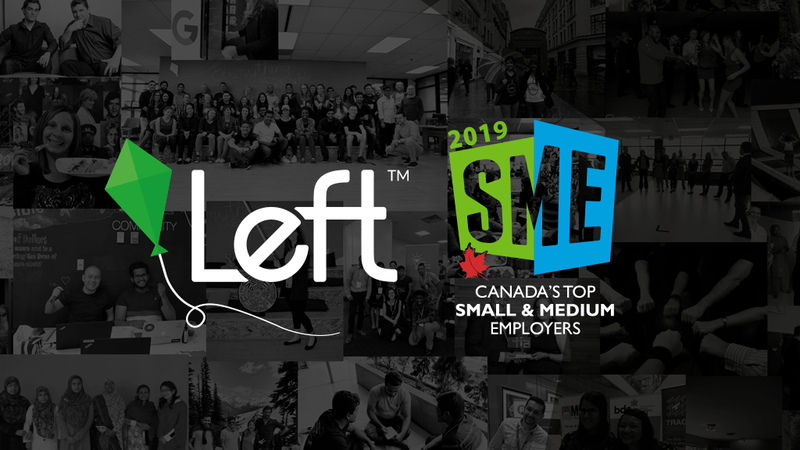 MAPLE RIDGE, BC — April 12, 2019 — Left, one of BC’s Top Employers, has been selected as one of Canada’s Top Small and Medium Employers by Mediacorp Inc. today. Now in its 6th year, Canada’s Top Small & Medium Employers is an editorial competition that recognizes the small and medium enterprises (SMEs) that offer the nation’s best workplaces and forward-thinking human resources policies. Employers are compared to other organizations in their industry to determine which offers the most progressive and forward- thinking programs. The annual competition is open to any employer with its head office or principal place of business in Canada. Employers must have less than 500 employees worldwide, including employees at affiliated companies and be a commercial, for-profit business. Left does exactly that and was highlighted for its outstanding HR practices including unlimited paid time off to volunteer, professional and personal development programs, and robust parental benefits. Detailed reasons for Left’s selection were released this morning and are accessible via the competition homepage. This award adds to a number of awards received by Left in the past year in recognition of their HR practices and corporate culture, including being named as one of Canada’s Top 100 Employers. The full list of Canada’s Top Small & Medium Employers was announced in a special magazine published nationally in The Globe and Mail this morning. Left is a B-Corp Certified, Canadian multinational media and technology company committed to using technology for positive social impact. Officially one of Canada’s Top 100 Employers, Left has grown to a global team of over 160. Left Travel, a brand of Left, has been using big data, A.I., and predictive analysis to convert high search intent traffic into quality bookings for hotels and short-term stays since 2010. With its mobile mesh networking project powered by blockchain and tokenization, RightMesh, Left is addressing the global challenge of connectivity — particularly in regions where the digital divide is greatest. Headquartered in the Vancouver-based suburb of Maple Ridge, BC, Left has offices and employees in Bangladesh, Singapore and the United States. Founded in 1992, Mediacorp Canada Inc. is the nation’s largest publisher of employment periodicals. Since 1999, the Toronto-based publisher has managed the Canada’s Top 100 Employers project, which includes 18 regional and special-interest editorial competitions that reach over 15 million Canadians annually through a variety of magazine and newspaper partners. Mediacorp also operates Eluta.ca, a large job search engine that includes editorial reviews from the Canada’s Top 100 Employers project and is used by almost 8 million users in Canada each year. Mediacorp also hosts the Top Employer Summit, Canada’s largest conference for senior- level HR professionals.